Rockingham – Don’t hit the wall! It’s one of the tracks where I’ve done a few hundred laps with motorbikes, so it was going to be fine to jump straight in, avoiding the extra expense of testing the day before and on the morning. Almost everyone else on the grid took advantage of the testing, and it was watching them in the morning session that I realised they were doing an extra hairpin on the infield! The first banked corner on the oval was also new to me, but I figured that was bound to be pretty much flat in the dry, and did it with a big lift to get up to speed. It was then that the front felt absolutely terrible, and the unstability made me think I’d gone far too soft on the front damping! During a red flag (we had a few very paranoid reds due to cars spinning off the circuit) I peeled off in the pit lane hoping to get Glenn’s attention to give me another few clicks of front damping. Before he could get to the car, we were off again, so I blasted off figuring the track time was more important than fine-tuning. The extra hairpin was amazingly tricky for me to try and get to grips with, totally upsetting the flow of the triple left I was used to. With the few qualifying laps we got in I didn’t get anywhere near familiar with it – but then I hadn’t with the braking points for the rest of the track, either! Still, I somehow qualified in 14th and 15th place for the races – amazing as I was struggling and really expecting to be around 25th with everyone else having tested here. …Because of course the skies opened just about an hour before we were due to race, and the track conditions were horrendous! Rockingham gets slippery (like ice!) with just a few spots of rain, and for this you could see the standing water. I’m still trying to love the rain, and with my limited testing time figured this was probably best for me to get me on an even keel. 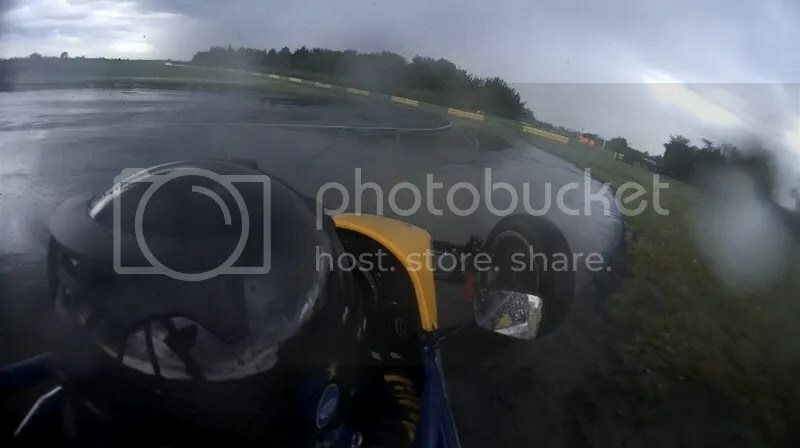 However – how fast can you take a banked oval turn in the wet? It’s about 240mph in an Indycar in the dry, but then they don’t even go out in the wet! We wouldn’t have that luxury. Weirdly, there seemed to be some unspoken agreement with almost all the drivers that we’d take this turn incredibly slowly to survive it, and then go for it on the rest of the lap. If you hit that wall in a Vee it’s going to hurt you, let alone seriously kill your car, so this rare sensibility from racing drivers was even more strange! Anyway – the race! I loosened off the front anti-roll bar and softened the dampers at both ends – but not too much at the front as I still wanted some stability. Slithering around the green flag lap, we could all tell how bad it was out there. When the lights went out just about everybody span their wheels off the line, but I hooked up a decent amount of grip. Unfortunately I was on the outside braking into the turn 2 hairpin, and cars streamed up my inside before I could turn in! When I finally got turned a car had spun on the exit, so I had to avoid them, too. Braking gently into the chicane, I felt everything lock instantly, and cadence braking didn’t do a thing. Two or three cars ahead were also going straight on and bouncing over grass and gravel – I reluctantly chose the gravel and was promptly airborne as I crossed the thinnest pit on route back to the circuit. On the restart I got another good – although sideways – start, but was again hung out to dry on the outside for turn 2! To add to the déjà vu, Pete Belsey spun on the exit in front of me, followed by Dave Leniewski exiting the next turn, and Colin Gregory a few corners later! Every time I brushed the brakes I locked up, and every time I eased the throttle down it spun up. It was brilliant but very slow! And somehow I was fighting with Jimmy Furlong with Pete Belsey and Paul Taylor behind me! As the rain eased going into the final lap, it was watching these two that became my downfall. I left my braking a little later, having taken the banked turn a little faster, and locked up a little. As I ran deeper into the corner, I could have just clipped the corner of the grass on the outside and carried on, but as I aimed for it I saw it had become about a 12” drop off the tarmac, with a puddle of unknown depth below that! 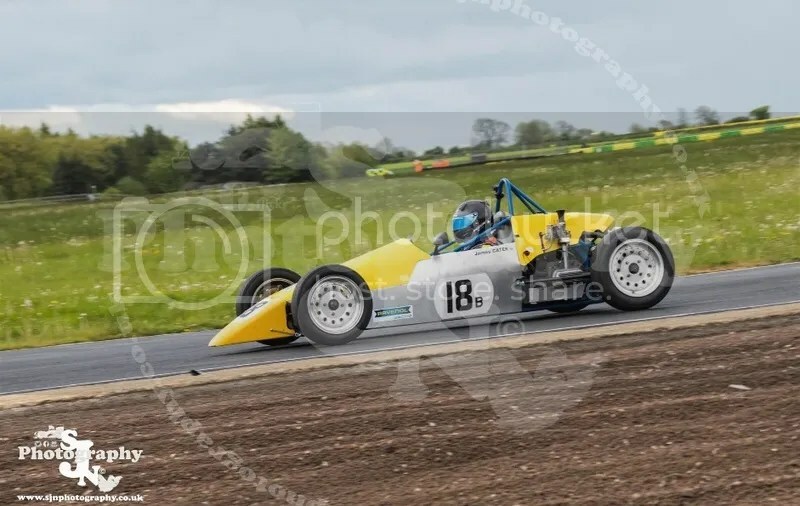 I had to abort and turn right up onto the banking through the cones, turning around and then rejoining the track having lost 12th place and dropped to 16th behind Mark Egan in his Ray. It also dropped me to 5th in Class B. With conditions on the infield still bad, and with oil spreading out at key spots, I was unable to catch Mark and had to sit behind him over the line. After almost drying out, the skies opened again during the RGB race just as we were due to go to the assembly area. 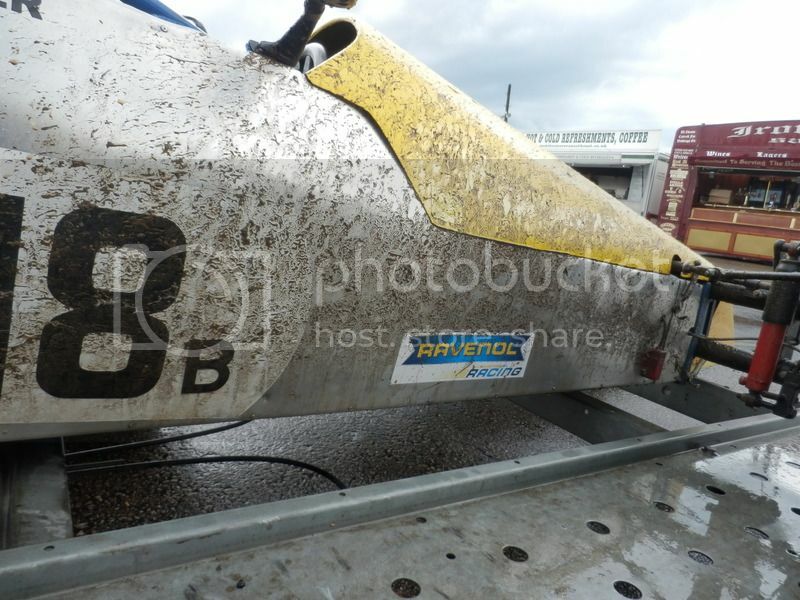 I’ve never seen huge rooster tails from the RGB’s before, and evidently neither had the organisers, as they cancelled their race due to weather. This then left all us Vee drivers in an awkward place. We were all set to go out, but as the current race had been cancelled there didn’t seem much point to us all going to the holding area to get soaked through, and have water go into our open carb trumpets as we sat there. I mean, evidently they weren’t going to send a single seater class out if they’d cancelled a race! As I stood kitted up next to a marshal under cover of my garage, 3 cars went down. I then heard radio chatter saying they didn’t have enough cars to run the race, and that “Vee drivers are voting with their feet”! Err, no we’re not! But as the rest of the radio chatter is calling for the safety car to go out to assess the track conditions – why do you want us to sit in the rain?? I asked the marshal to let them know we were all ready to go, but waiting for the track report, which he kindly did. Even though I was raring to go out in it, as were many of the others, the organisers finally made the decision to cancel the rest of the days races. It was frustrating, but also definitely the right choice. It’s amazing how a few poor results can affect you. So far this season, things have not gone well. I’ve been driving pretty badly, and combined with some car failures, I’d been questioning myself. Questioning if I can afford to be doing this if I’ve got no chance against faster cars and drivers with bigger budgets. 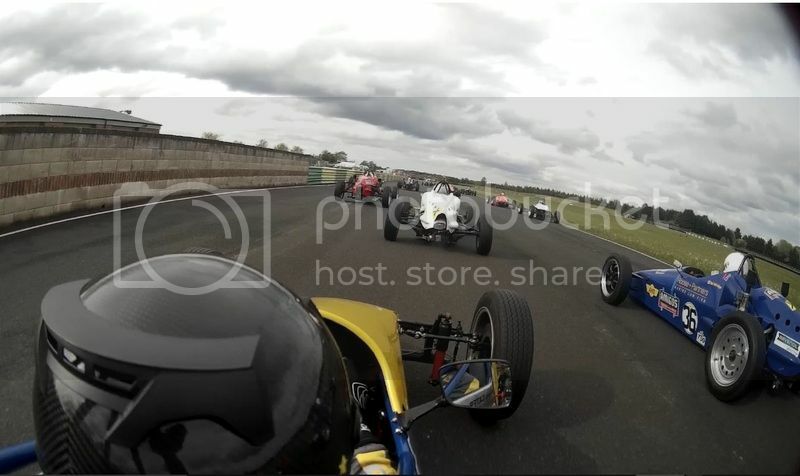 There’s no question that the other Formula Vee racers are more skilled than me – even those that don’t have a background in trackdays and karting have more experience in Vee’s, more testing, or just have youth on their sides! I’d been starting to enjoy the stuff in between races more – editing and processing videos, writing race/press reports, and the quest to find some sponsorship. Learning to enjoy that is no bad thing, as it takes an ungodly amount of hours fo my time – but I’m supposed to be here to race. When it was raining so heavily at Croft for qualifying, I was literally just following Tony Mitchell around for most of the session, eventually getting passed him but still just driving. If Miss Daisy had been sat next to me she wouldn’t have even spilled her cup of tea. Proper ‘meh’. I gave myself a bit of a shake after that, reminding myself of my Brands Hatch blog where I swore I’d push harder everywhere. As if to try and break my spirit even more, the track was now bone dry for the first race, and so my first ever dry lap of Croft would be at full racing speed. Except this time I was ready. I knew that in theory Croft would suit me. I’d watched video so I knew where to brake (although admittedly I’d watched James Harridges footage, which meant I’d know where to brake to get it ridiculously sideways and murder myself within three corners! ), and now I could just about remember which way the track went. So when those lights went out I just went for it. Now, up to this point I realise I haven’t sounded like my own biggest fan. I do have self-confidence, and have proved I can drive quickly at the end of last year. More importantly, when you flip that visor down nothing else matters. Nothing. When I’m staring through my blue iridium tint I can win, and I’m there to win. I still hesitated slightly before dropping the clutch and feeding the revs up, and the biggest gain I had over the rest was changing up to second, then to third. In second I knew I’d got a bit of a blinder, because I was already a few rows forward, and everyone else was looking slower. I simply drove through a hole up the middle of the grid, lifting off briefly as I thought I’d maybe stolen enough places, then getting back on it and diving to the outside to pic up a few more positions. I just figured I’d do whatever the car ahead of me did, and trust I had the skills to hold onto the car. When we came to the Jim Clark Esses I knew everyone said they didn’t lift off, and so I just kept my foot in and trust Glenn’s suspension work would help. It felt great getting through easily, and then taking the first two flat-out right handers the same! The brakes must have bedded in despite the wet qualifying, because they were sharper than they’d ever been. I looked through the corners and pressed on, seeing cars in my mirrors but nobody close enough to make a move. Then I hit the hairpin, and cars streamed passed as I tried to find second gear. That’s something I have to work on, because I lost masses of time! After that I just kept pushing a little harder everywhere. 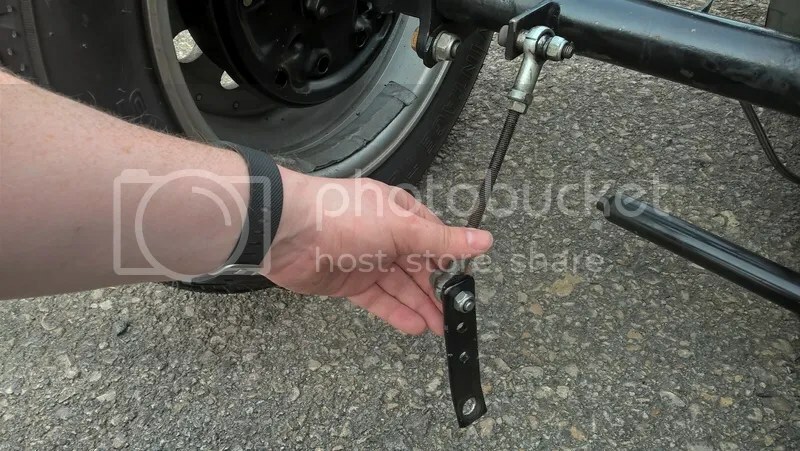 There is a big twitch where the weld on the anti-roll z-bar at the back snapped, and I dropped two wheels over the drop of a large curb, which pitched me back across the track in 4th gear flat out. I thought I was going to spin but caught it so fast, still keeping the loud pedal pressed down, that Darren Lomas behind me barely made up any time. Of course I didn’t know that the z-bar had snapped until after the race, and so just kept going, and despite the flying Alex Jones also getting passed me as I fished for second gear at the hairpin again, I came a respectable 13th. I’d also been revving the car higher, and although Jake Hockley in his much newer GAC was able to pull away on the straights, he wasn’t pulling away all that much. I have found that as I hit around 7000rpm the needle on the gauge starts doing all kinds of funky stuff except stay still and tell me what revs I’m pulling. I was estimating 7400rpm for my gear changes, and the car seemed happy with that. Anyway – between races we got one of the AHS crew to re-weld the z-bar, and were ready to go. I’d hyped myself up for the wet. I knew it was totally pointless driving like I had in qualifying. I wanted to use the dreadful conditions to get the car moving around a bit. In the wet you obviously reach the limits of traction much sooner than in the dry – but when the car does let go it does so more progressively. If you’re fast enough you can catch it and get the balance and drift. In theory, this will happen in the wet exactly as it would in the dry, but be more controllable. I hit the brakes about 4 times before we reached the first corner – because all I could see was spray from the 20 cars ahead, didn’t know if I’d be pushing my face up against their engines at any second in a surprise inspection, and couldn’t actually see the edges of the track to know where the corner was! I knew people ahead would spin off, and sure enough some cars appeared out of the spray at funny angles through the first chicane and I picked a way through as best as I could. My tighter line may have taken me passed someone under yellow flags, but as I couldn’t see more than 6ft away and didn’t even know which way any of the cars around me were facing, or if anyone was following me, I think I’d be forgiven for that one. Feeding in the power down the next straight the puddles were tearing at the steering wheel and the rears were spinning up at the same time, making things ‘educational’. As I gently eased the brakes on I could barely see if my wheels were locked up, and as I was aquaplaning anyway it was just plain weird. I cadence braked whenever I knew my wheels were locked, but to be honest that’s not as obvious in those conditions as you’d think. There were huge puddles on the inside of some turns, but already I was starting to enjoy myself. I even started dropping my front wheel into some of these puddles to help me turn the car! I wasn’t getting the power down as hard and soon as I’d have liked to, but I was pounding down the straights and braking pretty late into a few corners. The wheels were still spinning up in 4th gear on the straights, then puddles ripped you sideways under braking, the car slithered straight on through the corner and then snapped to oversteer, then even more so as you got back on the power! What a rush! I was getting a move on when Ian Buxton overtook me (he was one of the first corner spinners), but unlike every other time he’s done that I realised he wasn’t disappearing – I was still on him and actually had to drop back a bit as I didn’t want to spear him into a corner again! I knew it was treacherous braking into Tower, and so should have been braking much earlier with my new-found speed, but I either forgot where to brake or got too enthusiastic. The wheels locked several times and I knew I’d have to run wide, so let off the brakes deep in the corner, ready to snap on the opposite lock to catch it for a spectacular drift, and something went *ping* and the back swung around. I saw mud spray into the air as I hit the grass, and let the car spin 360 so I could get control in the right direction again, hitting the starter button and finding a gear to get me back on the black stuff. But the ping had been the weld on the z-bar braking again – meaning the rear had dropped down and that lack of clearance beached me in the mud. I tried rocking out in reverse before giving up and holding my hand up for the marshals to know I was stuck. I still had the engine running hoping for a push, but they pulled out the red flags to stop the race. They said it was too dangerous, anyway, so don’t think the race would have carried on much longer either way… At least they did give me a push so I wasn’t towed in behind the Wagon Of Shame again! So whilst it wasn’t great to end that way, psychologically the weekend was massive for me – in a very positive way! I know I can still drive fast in the dry and hold my own – even on a track I don’t know, with a broken car. And I know I can be properly quick in the wet. I mean, I was 9th fastest when I went off, but was barely getting up to speed, and properly enjoying myself as I did so! I didn’t think the weather was that bad! My test last year on Silverstone National was a fair bit worse, so I’ve got that as my wet benchmark – and I survived that! Mallory Park for the next race could be interesting, because I’ve done around a hundred laps around there on a Kawasaki ZX-6R B1H, but that was with the little bike chicanes in place. And I could find gears at the tight hairpin. One thing for sure is that I won’t be worried about it raining anymore! I made the call with Glenn to travel 180 miles up to Croft on the Saturday morning, rather than the night before. Glenn used to do this all the time when he raced, so I figured I’d try it and see how tired I was – assuming we made it in time for qualifying! Glenn has remounted the rear suspension lower down. This means we get a lot more suspension travel than before which should help with set-ups, and it’s lowered the rear and thus the centre of gravity. The aim of the weekend was to see how this all worked, and also run in some brand new brake pads – so Croft would be very much a learning weekend rather than anything competitive. I used to like the track on the old TOCA Touring Cars computer game, and spent some time watching onboard videos to try and remember which way to turn, but a lot of other drivers were there testing all day on the Friday, so it was looking like a weekend to stay safe and accept we’d be at the back. One thing you can’t account for is the weather. As we rolled into the collecting area, the rain absolutely hammered it down on us. With track conditions being borderline dangerous (they cancelled the following sessions for safety), we trundled out into the puddles. I followed a group of cars all tip-toeing around in the treacherous conditions, eventually skating passed Tony Mitchell, but was pretty much just driving around the track boring myself. After the first 2 laps, just as I was learning the track enough to pick up speed, the rain increased even more. It paid off for those who’d tested or raced at the track before, as they could get straight on it in those 2 laps, and lead to some excellent surprises such as Alex Jones snagging 5th place on the grid, and David Leniewski qualifying 10th! I dribbled my way home in a deserved 19th place to start from the back in both races. A mere four hours later, in scorching sun (I have pale blue, Polish skin, ok?) we lined up to go out again. Despite the drastically improved conditions, it wasn’t actually very much help to me, as I’d never driven a lap in the dry before! The lights went out at the start and I got a pretty good start. 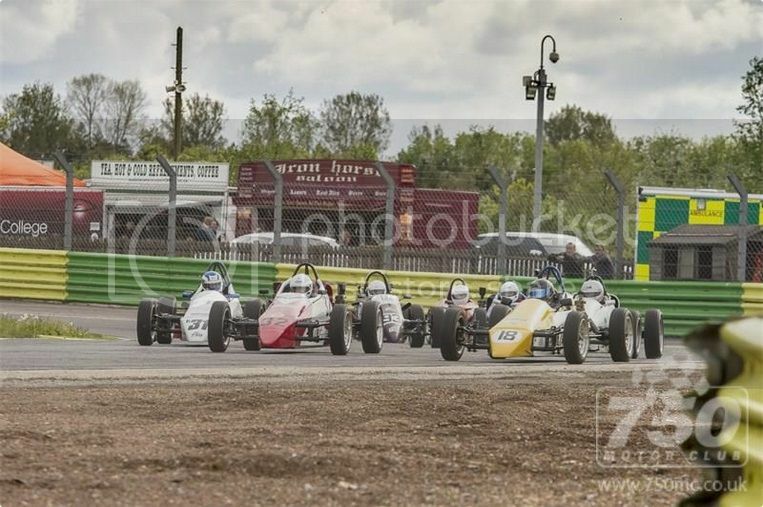 As I changed to 2nd it turned into a belter of a start, as I flew passed a few cars in a hole up the middle, and then after a hesitation dived to the outside into the first turn to pick up another few spaces – 6 in all! I was already up with David Leniewski, and having no clue what I was doing, just figured I’d copy him only brake later, carry more speed in, and get on the power sooner – and just hope I could hang onto the car! Back to my old “Throw it into the corner and sort out whatever happens” philosophy! I kept it absolutely nailed through the 4th gear Jim Clark Esses, and through the following rights as I hoped I’d remembered which of them you had to brake hard for. I eventually eased passed him when he had some mechanical problems, but not before my next biggest obstacle – the 2nd gear hairpin. 2nd gear is such a low ratio it’s very rare that you have to find it in a Formula Vee. Which is just as well, as you can’t find the damned thing. As I fished around in a bag full of crunching neutrals, a few cars streamed back passed me onto the pit straight. Eventually I found 2nd and fired off after them all. The red and white car of Darren Lomas was filling my mirrors as I tried desperately to keep on the racing line, now Jake Hockley ahead in the GAC with exactly the same dry Croft experience as me – i.e. none. As I came back into the flat-out section my car lurched left in the turn, making me run wide and drop two wheels down the small cliff on the exit at 120mph+. I caught the resulting slide quickly and kept my foot planted, turning the wheel back the other way to recover, and by some miracle stayed not only on the track, but still stayed ahead of Darren. He chased me hard for the rest of the race, and it was probably quite funny watching us at the hairpin as neither of us could get 2nd gear! Martin Snarey was right on the back of us, but I held on for an excellent and much needed 13th place and 4th in class B! More importantly, I knew I could hold my own against faster cars, and hit a brand new circuit first time out and be quick. I’d started to doubt this. And I knew I could knock a good 2 seconds of my time even if I still couldn’t find 2nd gear! As I climbed out in parc ferme, Darren pointed at the back of my car. The weld holding my anti-roll Z-bar had snapped – explaining my high speed moment in the race! So we still didn’t really know what the rear modifications had done for the car. One thing I did know for sure was that the new brake pads were awesome already! After a hot and sunny Sunday, precisely as we were kitting up, the skies went black again! All thought of knocking those 2 seconds off my times were washed away in the waterfalls that hit Croft as we waited for 20 minutes for the officials to decide if it was safe to go out. Sat under umbrellas, joking with Sam Engineer, Adam McCauley, Glenn Hay and Chris Wilshire, I figured there was no chance of them starting us, and was tempted to be the first to start up and drive back onto the trailer. Suddenly, they waved us out on track. Good – because I couldn’t live with my wet performance from qualifying. Already soaked, I could barely see the track even on the slow lap around to get on the grid, let alone the car ahead. And there’d be about 20 of them off the start! The lights went out and I got away without wheelspin, but as soon as we were in 2nd gear I couldn’t see a thing through the spray. I hit the brakes about 4 times before I even got to the first corner, and could see carnage through the deluge. I held an inside line and skittered passed a few spinners, wary of anything going into the back of me, and tried to find a compromise between having some visibility and getting between the puddles without them ripping the car off the track. I was determined to use the conditions to get the car a bit sideways (it’s easier to do in the rain) and try and get more comfortable doing that, and found that I was really enjoying it! Cars kept appearing out of the spray, and I was able to get by them despite locking up a lot, getting wheelspin in 4th gear on the straights, and having to save a good few slides. Ian Buxton slithered passed me, and I hung on to the back of him fairly easily (that’s a first!) so knew I must be doing something right! Martin Snarey was ahead, and I was flying up behind him when I had a major loss of 2nd gear at the hairpin. I watched Martin drive away down the straight, and was about half way down myself before I found a damned gear again! I kept powering on, actually hooking my front wheel into some of the puddles to get the car turned in better, and knew where I could grab loads more time, and then disaster struck. I had a huge lock up as I braked for Tower, and drifted out very wide – not a problem, as I eased a bit of throttle back on to slide it back into the corner when the back end twitched again as the re-welded Z-bar broke again, spinning me off into some filthy great muddy field. Even that wasn’t so bad, as I was ready to drive out, but the car had dropped as the z-bar disconnected, and I got beached in the mud. I tried in vain to reverse out, then had a vague recollection of an off-roading technique of rocking it out, but it was no good. I waved for the marshalls and the race was red flagged as conditions were too bad and nobody wanted a stack of Vees growing in their turnip field on top of me. A quick push and I was on my way again, but despite having been up to at least 12th when I went off, I was only classified in 19th at the finish. I’m not disappointed with that in the slightest – because I also set the 9th fastest lap overall! That’s a huge confidence booster on its own – but combined with my dry performance in the first race it was a psychologically fantastic weekend for me! I had brilliant fun in wet and dry, and my confidence in the car is coming on in leaps and bounds. I know I’m headed back in the right direction at last, and I know I can do much, much better – and that’s all with a damaged car! 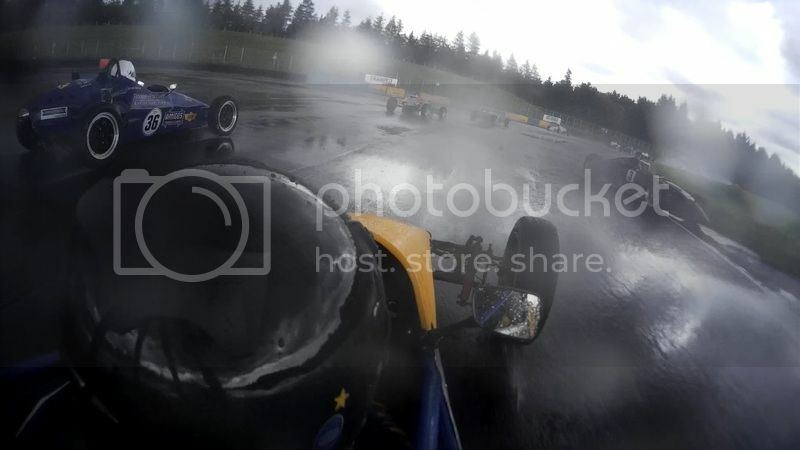 There might be 2 James’ in Formula Vee doing rain dances for the rest of the year! Speaking of which, James Harridge came in 2nd behind the seemingly unbeatable Paul Smith, with fellow n00b Harry Webb picking up an excellent 3rd on the podium!